We have decided the best way for us to complete our exploration down the Central Hawkes Bay coast is from Takapau, between Waipukurau and Dannevirke, taking the route highlighted in yellow below, and travelling anti-clockwise. My husband knows I always choose the more scenic route. I definitely don’t want to take the more direct route down SH2 to Dannevirke and then turn off. 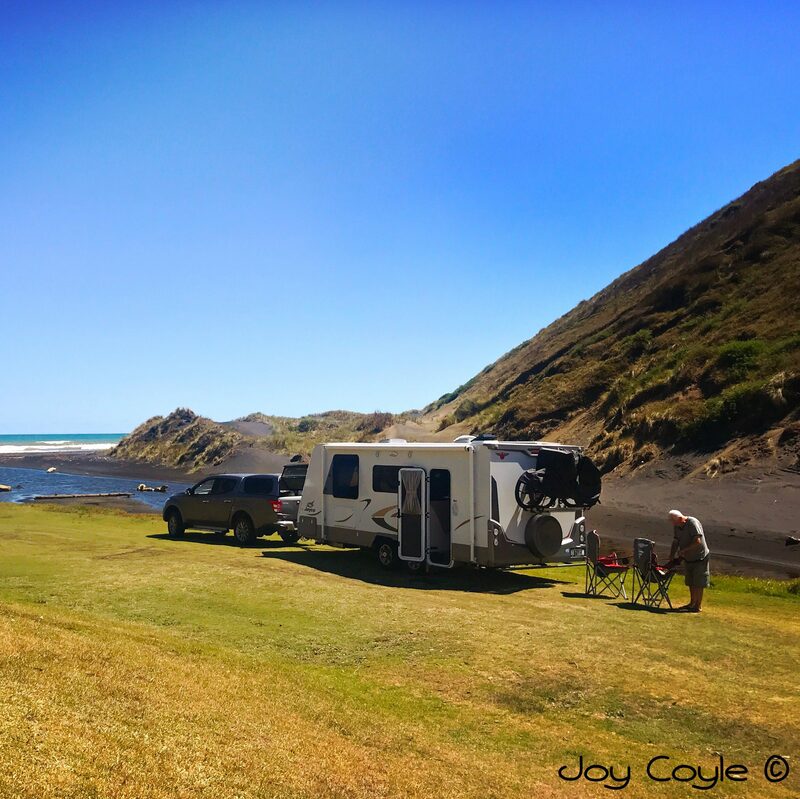 We are staying at the Takapau Motorhome Caravan Park #3940 for a couple of nights, which is perfect. A large grassed flat park with everything on site, including dump station, and Scott, the caretaker, is very friendly and helpful. Next morning we set off for the coast. At the turn of the 20th century Weber was a thriving community as an overnight coach stop for journeys to and from the coast. Today it has only a school, a church, a pub, a community centre, rural fire station, and a few houses. Wimbledon is our first stop. It was named in the 1880s after Wimbledon in England, when a local resident shot a bull from a considerable distance, which was said to be worthy of the Wimbledon rifle championships of the day. The name stuck. It’s nine kilometres from the coast and on the old route between Waipukurau and Masterton. Seemingly in the middle of nowhere, the Wimbledon Tavern appears ahead of us. This is a heritage listed building built in 1886, and is now a popular destination for bikies, tourists and Sunday drives. They serve good pub-style food. We just had coffee and a bowl of chips as it was the middle of the day. I’ve wanted to visit this place since my brother Kelvin told us about it after one of their motor cycling trips. A bucket list tick from me! I really love these out-of-the-way places. Herbertville was previously known as Wainui after the Wainui River which flows out into the Pacific here. It was once a busy coastal centre. Picture schooners beached on the vast shallow sandy beach in high tides, passengers and cargo being off-loaded to be taken inland to Dannevirke via Weber by horse-drawn coaches. The schooners would then be refloated at the next high tide and carry on their way. At the turn of the 20th century Herbertville had a blacksmith, a large hotel, several shops and a police station. These days it’s a quiet seaside village with a camp ground, a golf course, and the Beachaven Inn, which is the old Herbertville Hotel reinvented and now a licensed cafe, restaurant, bar, accommodation, and general store. Good fishing, walks, and a seal colony at Cape Turnagain are attractions, not to mention the lovely beach. It’s time to leave Herbertville, so we head back to Wimbledon where we take the old state highway 52 route to Porangahau. …before heading back to Takapau via Waipukurau. Driving into Waipukurau we passed what remains of the old hospital. It’s apparently been in private hands since it’s closure in 1999, when the area was considered too small to warrant such a large hospital facility. There have been a number of fires throughout the site since then and it becomes more desolate by the day.